wild turkey. Via Wikimedia Commons. The turkey doesn’t get a lot of respect. We mock its gobble, eat it for major holidays, and use its name as an epithet. Yet, Benjamin Franklin at least privately thought the bird was noble enough to be nominated as the national bird—clearly, the bald eagle won out there—and the lowly gobbler has a long and illustrious secret history that researchers are just now beginning to uncover. Domestication of animals and plants do not make for gripping headlines, but such achievements represent major turning points in the evolution of human culture. With domestication came villages, then cities. With domestication, people had time to turn to less mission-critical activities, such as art. And the process of domestication itself makes for a fascinating study in species interactions. Think what it must have required to take wild turkeys or donkeys or pigs and assiduously, over the years, produce the relatively docile creatures we see today. The turkey we belittle so offhandedly was so highly prized among indigenous Americans that it may not even have been used as food at first. But it did eventually become an important protein source for indigenous peoples, in addition to providing feathers and bones for ornamentation and other uses. Strangely enough, the turkey we eat today—the one that gets pardoned at the White House every Thanksgiving and serves as an icon of a U.S. holiday—isn’t even descended from the native turkeys of the Americas. How did that happen? It all may have begun about 800 B.C.E. when indigenous Americans might have first domesticated the animal. Some research suggests that the event happened twice, a pattern of repeats that already has emerged with Old World domestications of sheep and pigs. 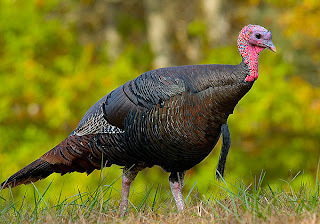 One turkey breed achieved importance in South Mexico, where the native peoples domesticated the wild South Mexican turkey. But the turkey also proved to be an important feature of native culture in what is now the southwestern U.S. Evidence from bones and fossilized excrement—coprolites—from archaeological digs in the area show that the turkey’s importance goes back at least 2000 years there, as well. In addition, analysis of the mitochondrial DNA—which passes only from mother to offspring and accumulates mutations at a slow, predictable rate—yielded two unexpected finds. First, these birds did not make their way by trade from South Mexico to the American Southwest, as did other domesticated products like maize and beans. Instead, the indigenous peoples of the Southwest did their own domesticating, taking as their starting bird the Rio Grande/Eastern wild turkey. A bottleneck in the genetic history, indicating a severe reduction in numbers and genetic diversity, shows that the native peoples of the Southwest strongly selected for a specific breed of their domesticated bird. And then they propagated it for at least 1000 years. You might think that the turkeys we eat today in the United States would be descendents of these Southwestern birds. They’re not. When Europeans showed up in the Americas, they grabbed a few of the birds and took them back to Europe, where they bred new strains. Meanwhile, in the American Southwest, the domesticated turkey faded away, replaced by other food stocks like sheep and chickens and wiped out by disease. Today's turkeys that appear on Thanksgiving tables, new research indicates, show a considerable lack of diversity in their genome sequence compared to DNA from South Mexican turkeys that were collected in 1899, even less than other domesticated food animals like pigs. So where did they come from? Genetic analysis indicates that they originated in the wild turkeys of South Mexico, but having been bred anew in Europe, they’re really a form of inbred European export with the name of a country (Turkey) that has nothing to do with their origins. They are, according to the new research, genetically distinct from their wild ancestors. Benjamin Franklin was a wise man, but he couldn’t have known that he was proposing a European breed to represent his newborn nation. That said, the turkey still stands as one of the few native domesticated animals of the Americas as most of our other familiar domesticates originated somewhere else. The opinions expressed here do not necessarily either conflict with or reflect those of the DXS editorial team or contributors.